This past May, I traveled to Turkey for my final graduate school field seminars. One of the sites we visited was the ancient city of Thermosos atop a mountain. While the city itself turned out to be rather impractical (difficult to have water, supplies, etc), the backdrop for their theater is breathtaking. I just wanted to share a little piece I wrote about my experience there. Enjoy! You could say that once you have seen one Greek or Roman theater, you have seen them all. In a sense, it’s true. All the parts are the same. Same guidebook schpeel. Did you know you can tell if its Roman by the arches? The one thing the Greeks don’t have is arches. But it’s not the parts that make it special. You could say it’s the acoustics, each one is exactly perfect. But it’s not that either, it’s the setting. In Athens, the theater is by the Acropolis, facing the sprawling city. 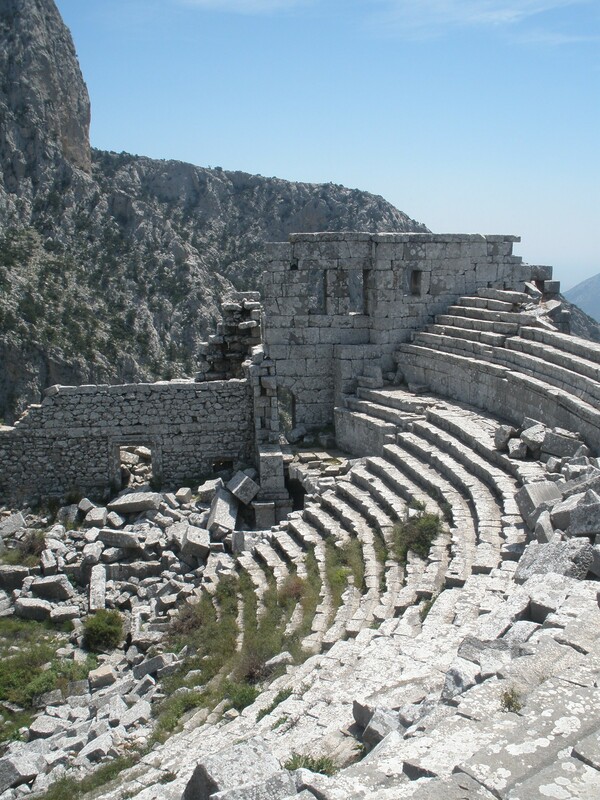 But in Thermosos, the theater is tucked against the peak of a mountainside. The sharp face of the opposite mountain is the background of the comedy and the tragedy. The cold mountain air creates the atmosphere.